What’s the best way for our employer to find someone quickly who has great skills and who’d fit in with the team? Ask people around them that they know and trust. The easiest place to find suitable candidates is by asking people they know – people in the industry and their own employees. Plus, if they find people this way, it’s likely to cost them a lot less than hiring a recruitment company or multiple postings on a job board. Why should this matter to you as a job hunter? The easiest way to get yourself noticed by employers is to get yourself into the space where they’re looking. And of course, the most efficient way you can do that? … By networking in person. I know that networking can sound like a daunting task but you’re probably a lot closer to useful connections than you realize. These are people you know directly. These are people you could reach out to today and arrange to meet for a coffee. These people are the connections of your Group A individuals. Once you’ve had your coffee chat with people in Group A, these are the people you now have “access” to, your Group A connections can put you in touch or speak to them on your behalf. You might know some of these people from stories your Group A connections have told you, you might not. But if your Group A connections are willing to help, then Group B just opened up. The direct connections from your Group B chats, are people you don’t already have some acquaintance with. This is where the real power of networking comes into play. If you already knew someone who worked for a company you want to work for, or in an industry that you’re trying to get a foot in the door of, I assume they’d have been the first people you spoke to. But if you’re in the position of feeling like you don’t have any “useful” connections in your network, Group C people are why you should still be reaching out to ALL your Group A connections. Your hairdresser’s cousin’s next door neighbor is head of HR at your dream company? That’s a Group C connection. While you hairdresser might seem an unlikely place to start, the more people you talk to about your plans (while not jeopardizing any current job you’re in), the better. You have absolutely NO idea who’s in Group C of your network. By the time we get to Group D, the number of connections we’re talking about is massive. If you only have 5 Group A connections (unlikely, but let’s stick with it), and each of them only has 5 connections (again, who only knows 5 people?! ), and everyone in the chain speaks to 5 people… by the time we’re at Group D we’re talking about 625 people! Surely you can see that, even with the low estimate of 5 connections per person, if there are 625 people eventually “accessible” within your network, someone has to have some useful information for you! And that’s why, even when you don’t know anyone that directly works in the industry you’re trying to move into, you should speak to each and every single person you can. It’s not just about accessing what they know, it’s about opening up opportunities of who they know. All too often I hear people saying they don’t have any suitable connections in their network. That’s just not true. Ever! So grab yourself a copy of our Network Mapping template (download link is at the bottom of the page) and start plotting out ALL of your Group A connections! A great example of people who could be extremely useful but aren’t in your target industry are the people who are your references on your CV (or the people you would consider asking to do this). These are people who should know you, know your strengths and be able to help you identify the skills you are uniquely placed to offer employers. 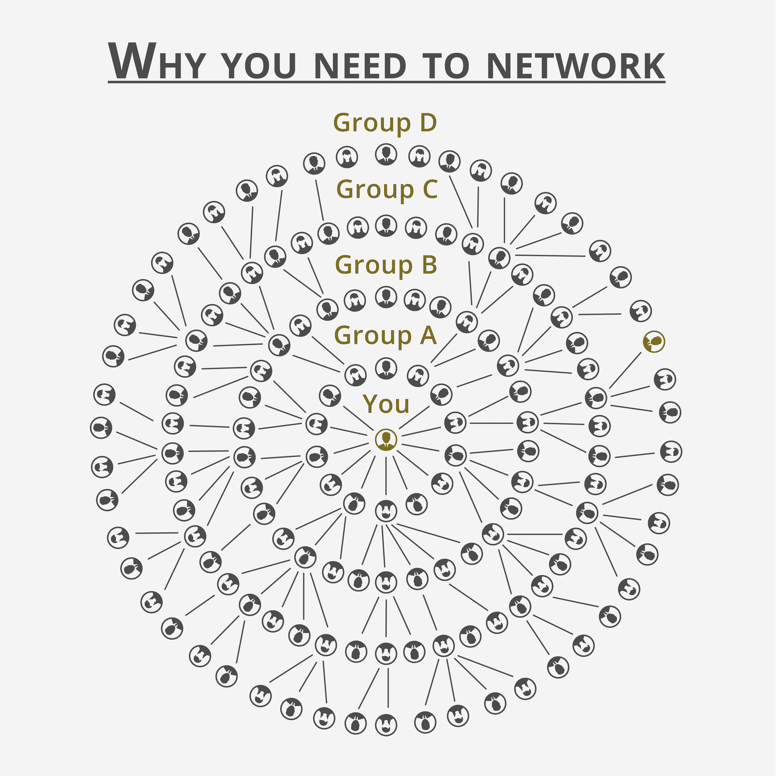 What ALL people in Group A can offer is their own network. But similar to most people I encounter, many Group A connections might think, “I don’t know anyone in that industry, I can’t be any help to you”. So take the time to explain the other ways in which their connections might be able to help (back to our list above). People in Group A are people who are going to be most willing to help you out. These people want you to succeed. While “networking meetings” with this group is really just catching up with someone you know, make sure you’ve taken the time to prepare so you cover all the relevant points when you’re actually sitting with them. Networking meetings with people from Group B onwards (or “outwards” on our diagram), will be a little different. That said – human nature is to help others when we are asked to. You just need to pitch it a little differently. Try to meet with them face-to-face. Even a quick chat over a coffee can give you a huge amount of information and improve the chances that someone will remember you if they hear of any opportunities. It would take several back and forth emails to cover what can be talked over in a half hour conversation – so although you might feel that an in-person meeting is encroaching on their time, it’s probably more efficient in the long run. Before you meet them, make sure you’ve worked on your personal pitch – using a version of this is a great way to succinctly explain to a stranger who you are and what you’re trying to achieve. As you set up meetings, be clear about what you hope to achieve from each one – it’ll likely be different every time, depending on who you’re meeting. Once you have your goal for the meeting, plan out questions you want to cover. There’s no harm in writing these down or making a note in your phone if you’re worried you’ll forget. Try to use open questions to get the more useful responses. These are questions that can’t be answered yes or no. Questions that start with “why” or “how” are good for information gathering. So is framing a question “Can you tell me a bit more about…”. Of course, once you get talking you might end up achieving a whole lot more than you set out to, but you should always come out with your original goal met. In terms of goals for these connections, you can’t go expecting that they’ll set you up with an interview. Frame your questions more as information gathering, if they offer to be of direct help, great! In addition to one-to-one meetings, you should also consider attending local networking opportunities. These types of events will put you contact with several new people within the space of an hour or two. They’re also a great way to introduce new people (and their networks) into your own networking diagram. Check for local networking events, industry-specific events locally and careers fairs. Having a personal pitch is a must for these events – you need to be able to explain your situation briefly but effectively in a short space of time. The goals are likely to be a bit more general for these events but you should still consider what you’re hoping to achieve – perhaps to meet 5 new people who’d be appropriate to follow up with individually? The specific aims of each networking meeting will always be slightly different. But one aim you should have for every single networking meeting you have is to come away from it with new actionable points – specific things you can do to improve your chances of landing a job. That could be something as simple as following up a new contact, making suggested changes to your CV or attending an event you’ve just learned about. Aim to be a step closer to your new dream job after each networking meeting. And do lots of these – as many as you can. Hopefully, with enough time and effort, you can start moving into the space where hiring managers are looking first when they have a vacancy to fill. And really, who doesn’t want to be in that space? !